Need better system data and monitoring? Want confidence in your treatment performance between testings? Determined to save time and money on your water treatment program? Look no further than the G-C LumiTrac® system. 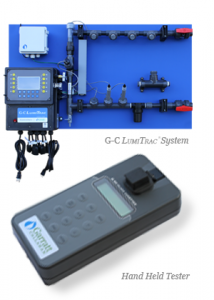 The G-C LumiTrac® system combines the best of innovative G-C treatment and technology to ensure continuous monitoring, reliable treatment, and fast and easy-to-access reporting. All this boils down to G-C LumiTrac® saving you time and money. Start saving resources and controlling your system with confidence today.